Plan your day excursion to Capri with an experienced native, born and raised here, who will lead you to the discovery of all the hidden corners of Capri, discovering the island in such a way that only a native can do. 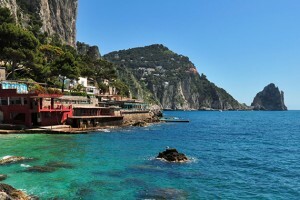 Capri is composed of three levels: Marina Grande, Capri and Anacapri. With us, you will visit the most beautiful places in Capri, in just one day. According to your requests we will choose the most suitable means of transport: a convertible car with a private chauffeur, the cable-car that goes up to the Piazzetta or a luxury boat for an exclusive tour around the island. So many ways to experience Capri, but all capable of making it a unique experience, just live your dream! Marina Grande is the harbor from where all the ferries arrive and depart to and from the island. This is also the starting point for the boat tour and the visit to the Blue Grotto. Here you will find several souvenir gift shops, cafes overlooking the sea and a beautiful beach. From Marina Grande you can go up to the island of Capri in different ways (with the private convertible car, by funicular or private minibus). The center of Capri is all concentrated around the famous Piazzetta. We recommend a stop here for at least a coffee. Then you can continue your walk along the shopping streets, such as Via Camerelle and Via le Botteghe, stopping for souvenir photos in scenic spots such as the Gardens of Augustus and Punta Tragara. The town of Anacapri is located on the upper part up the island. Here we will visit, Villa San Michele, and can take the chair lift to Monte Solaro, the highest peak. Anacapri is a great place to devote time for shopping. What's so nice to see in Capri? Here are the most famous places to visit on the island during your holiday. Enjoy the beauty of Capri and its coast with our exclusive services. We created some excursions tailored to all types of travelers, both around the island of Capri and the Amalfi Coast, Pompeii, Naples and Vesuvius. Why Choose Us? 6 good reasons to choose Guide Capri! No line ups or delays! Guide Capri has official and authorized tourist guides, which means they have the advantage of taking the preferred lane in order to avoid long waits. 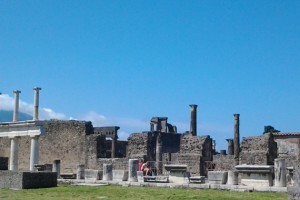 Especially for those tours concerning the Pompei ruins. We recommend pre-organized tours, however, flexibility is our strong point, so do not hesitate to contact us for your own personalized tour! Thanks to Guide Capri you will be able to enjoy the places you want to see and where to eat according to your preferences, while we help you stay on schedule. With Guide Capri it is worth not having a middleman! This means that there are no intermediates, to make our prices go up. Therefore, if you are a private or part of an agency, do not hesitate to contact us. You will be astonished by the conveniences and admire our competent guides. With Guide Capri you will be able to organize your shore excursion in advance, saving money and precious time. This will reduce the price significantly, an advantage that you will not find with another tour! Guide Capri has professional multilingual guides that will take care of all the little details of the itinerary, bookings, and whenever possible at your place. 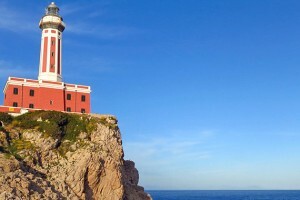 The excursions of Guide Capri are unique, personalized and likeable. We can quickly identify who you are and and what type of tour is best suited for you. For example, for the school tours, we make them a lot more entertaining in order to maintain the childrens' attention. Our personalized tour does not only mean the tour itself but we also choose the appropriate guide for the specific group. This personalization can also permit you to take advantage of our services.